I know, I know. You’re thinking: “You just *had* to pull out the ‘One Night in Bangkok‘ thing, right?” Well sorry. I just got back up north, having spent the last 5 nights either sleeping in a coffin-like bunk on a dive boat or on a bus during a 12-hour overnight trip back north from Khao Lak. And when I finally checked into the dingy but cheap Rainbow Guesthouse and went to a nearby cafe for the first proper coffee in a WEEK, a leaky ceiling dripped into my mug. So PARDON ME for being sleepy and under-caffeinated. I’d be cranky as hell except for the fact that I just went on 15 dives in 4 days. Everything is at it should be. 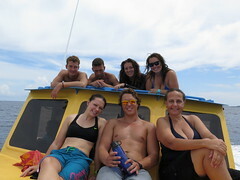 The diving in the Andaman Sea was exactly as advertised: varied dive sites, varied aquatic life, and great people. I really wish I had an underwater housing for my camera so I could have taken some pics. A bunch of others did take photos, though, so I’m hoping to get a few. Stay tuned. But in the meantime: wow. Three different Manta rays (all at the same site on Koh Bon – two in one dive! ), a couple of leopard sharks, a sea horse, a sea snake, and tons of moray eels, lionfish, angel fish, parrot fish, etc etc etc. (YOU Google ’em!) The variety was crazy. 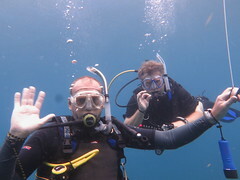 And in the middle of all this nutty diving I managed to finish my advanced open water course, too. Next PADI certification on my list: Rescue Diver. The fantastic folks at Similan Diving Safari ran a perfect trip: it was tight and serious when it needed to be (safety, protecting the reef, etc.) but laid back and fun all other times. And only a little Bob Marley. The food, cooked by these tiny Thai women in the tiny onboard kitchen, was amazing. The Thai “boat boys” did everything: from filling our air tanks to helping us on with our fins to mincing meat for the kitchen staff to attaching us to moorning lines. Everyone was always smiling and goofing around and having a good time. One noteworthy feature that I imagine keeps the Thai staff happy: The owner of the shop lets the Thais provide soda and beer for purchase, and they get 100% of the profits. You can imagine that most other shops would keep beer – a surefire profit center where divers are concerned – to themselves. Just one reason I felt good diving with them, and would absolutely do so again. 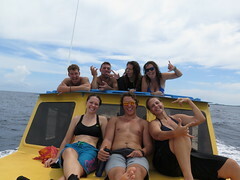 There were 21 customers, but enough dive guides so that the maximum # in a group was 4 customers/guide. Customers and staff were from the US, Canada, France, Denmark, Germany, Italy, Argentina, South Africa, Scotland, England, and one Australia/Singapore/various mix. I met an English woman who lives in Siem Reap, which is one of my destinations. So I’ll have a local connection when I get there. Yeah. ← the land of smiles?